On Tuesday, the paperback edition of The Last Bridge will be released everywhere. I imagine that having a story released into the world is similar to sending your child to school on the first day or dropping them off at their first dance. There is a part of you that knows they are ready (even if you might not be) and knows that you have done everything you can do to make their journey a safe one. That's how I feel about my paperback. Even now, after living with this story for almost a quarter of my life, and having a great experience with the hardcover launch, I am anxious and excited. I want the world to like Cat Rucker, I want them to understand the story. This time around, I have some confidence that the book will continue to find its' way into the hands of many readers who respond to the intensity of the story. The best part of being published is connecting with readers and hearing their stories and listening to their response. I have met many wonderful people so far and am starting to feel as protective of my readers as I am of my book! On the brink of the paperback release and of my release of the draft of book two to my agent, (more on that in the coming weeks) I feel like a mother of two children -- one starting first grade and the other pre-school. On Tuesday I will wake up and think about the book sitting on shelves, displayed on tables and considered and viewed by potential readers. As it makes its' way into the world I will stand in the wings and remind myself of all the love, hard work and passion my, agents, editors, sales people, publicists, family, marketing, readers, bookstores, proofreaders, teachers, copy editors, designers, typesetters, and friends gave to The Last Bridge. While the process of writing may be solitary, the delivery and execution of a book takes a village. Thanks Teri! 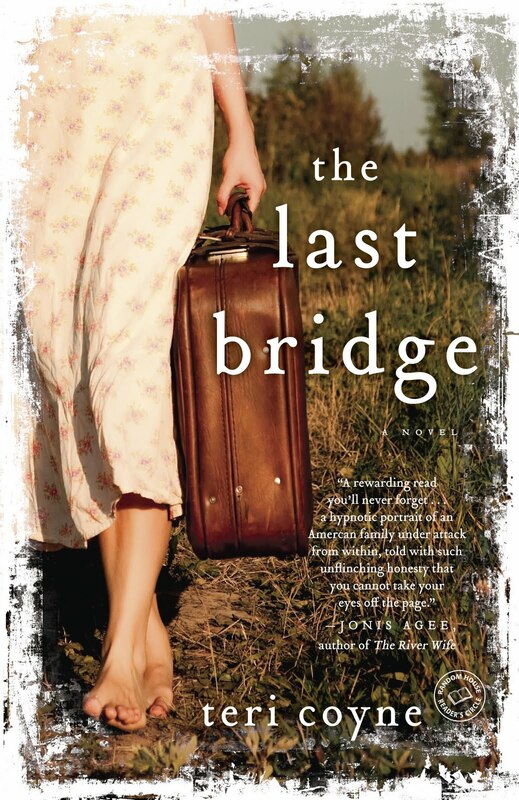 Just recieved an email letting me know that I have scored a copy of The Last Bridge. We have a "book circle" here on the Lake where I live. Once I have read a great book I pass it on to one of the women in the circle who passes on to me a book that she has read and we go around the lake with our favs this way. It is fun and I am looking forward to sharing and reading this story. I received my copy of "The Last Bridge<" today. Thank you so much. I had planned to call my daughter to come over and give it to her as a surprise. Guess what! She was here doing my laundry and brought in the mail. I didn't know it had arrived until I saw it on the table. I told her how I came to receive the copy and that it was for her. She was so excited. Said she'd never had an autographed book before. I said I might have to give her my hardback since it wasn't autographed. She agreed but looked relieved when I told her I was kidding. The timing for the arrival of your book couldn't have been better. Once again, thank you. You helped brighten my daughter's day, and she needs something to give her a lift. PeeEss~I chose "Anonymous" for an identity because I don't have a Google account or a blog, but I knew my name would be in the post.